Some passcodes are so effective that even you can't remember what they are. Can't sign into your iPhone anymore? If you've locked yourself out of your iPhone, what can you do? This article will give you the best way to reset iPhone screen password easily. Actually, two main parts are included in this page: How to get iPhone data backed up; How to reset your iPhone password. Learn details now. If you've forgotten the PIN, haven't set up Touch ID on a modern iPhone, the only option is to restore the iPhone as new, which will delete all of your personal information. In this case, you'd better make a backup first to ensure you won't lose anything. Generally, it is possible to back up your iPhone data either through iCloud or iTunes. While, there are some limits. For example, iTunes can automatically remember the password once you connected your iPhone to it and entered the password before. In this case, it's pretty easy to backup your iPhone with iTunes. Well, there is a condition that you can't restart your iPhone after the last time when you use iTunes to sync your iPhone, or iTunes will ask you for the password again. What can do you do? Actually, there is another data backup solution for you. 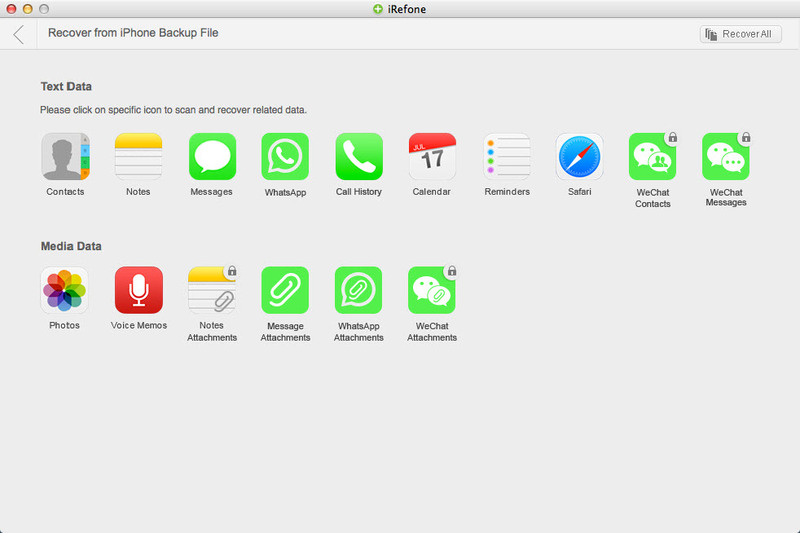 First download and install iRefone for Mac, which is able to both backup and restore iPhone data selectively. With it, you can export Contacts, Notes, Calendars, Safari Bookmarks, Messages, Voice Memos, WeChat Messages, Call history, Photos, etc and transferring to computer for backup. For Windows users, you can turn to iRefone. 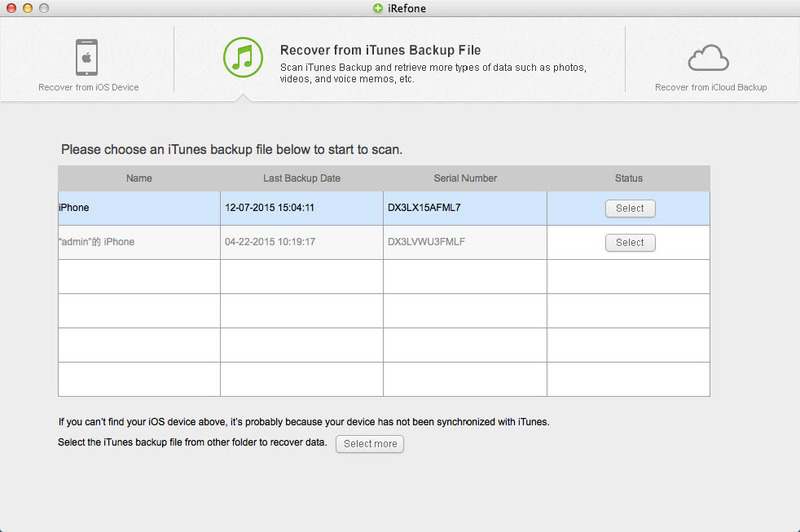 Launch iRefone, and go to "Recover from iTunes Backup File". Then you can see a list of all backup files in your iTunes for different iOS devices. Target the one for your iPhone and click on the "Select" button to move on. The scan will take you a few seconds. After that, you can preview all data extracted from iTunes backup. Check them one by one and tick the item you want to keep. At last, click on the "Recover to Mac" button to get all the data you need saved on your computer. To recover or reset your Apple ID password or the screen lock password is not a complex process. Making the device accessible once more is very straightforward. 1. Attach a USB cable on your PC while ensuring the iDevice end part of the cable has not been connected and launch iTunes on the PC. 2. The device has to be turned off by holding down the button for power and swiping until it has been turned off. 3. Begin recovery mode by pressing and holding the device's home button as you connect the device to the other part of the USB cable already connected to the PC. As you connect the device, it will turn on as a result. Resume holding the device's Home button and wait for a window to pop up within iTunes with a message to the effect that it has detected a device already in the Recovery Mode. 4. Restoration of the device in iTunes can now start by clicking "OK" within the appearing window. In iTunes, choose the Summary tab before clicking the button for Restore. The process ensures all the settings and data from the device has been wiped. It will be reset to default factory settings. 5. To return the data into your iPhone, an option of restoring an iTunes or iCloud backup is provided. Restoring from the iCloud requires an Apple password and ID including a backup file previously added on iCloud. On the other hand, restoring from iTunes require a previously backed up file on your PC. 1. Go to iForgot website for Apple IDs to reset and change your password. In case you are unable to recall Apple ID, iForgot should also help. 2. Add the ID, mostly the email address used to sign up into the site. Click next and if you do not remember the ID, there is a link beneath the text area to click; follow the provided instructions. 3. Identity verification is a must and Apple does this in two ways. Firstly, an email containing a link to confirm is sent to your registered email. Secondly, you only need to answer a security question and verify yourself, in most cases your birth date as well. 4. You can then reset or change the password and ensure it is not only easy to recall but also secure.